When we got our first information on the 2014 Ford Mustang months ago, it was understood that the order bank would open on November 12th, so it makes sense for the official company order guide to surface this week. Not surprisingly, it looks like pretty much everything that we heard in August from The Mustang Source is accurate and the bad news is that the Mustang Boss 302 indeed seems to be gone. The only mention of the awesome Boss 302 in the 2014 Mustang order guide is the fact that the School Bus Yellow paint option - which was exclusive to the 2013 Boss 302 - has been deleted. Click here for a look at our original piece detailing the changes for 2014. When the new Boss 302 was introduced for the 2012 model year, Ford Motor Company expected for the modern Boss to be restricted to a 2 year run. Unfortunately, that appears to be the case. Part of the 2014 Ford Mustang order guide is a page that details the major product changes and as expected, the categories for Interior Changes, New Functional Equipment Changes and New Option Changes are all followed by “None”. Luckily, the 2013 Mustang V6 and GT have gobs of power and great fuel economy while also offering a comfortable interior layout with plenty of options. The only Exterior Changes for the 2014 Ford Mustang is the deletion of 3 colors - Red Candy Metallic with Tinted Clearcoat, High Performance White and the aforementioned School Bus Yellow of the 2013 Mustang Boss 302. Replacing High Performance White is Oxford White while the Red Candy Metallic with Tinted Clearcoat is replaced with Ruby Red Metallic with Tinted Clearcoat. School Bus Yellow will not be replaced since the Boss will not be continued. Finally, Exterior Appearance Package 101A has been deleted. Ford has added two new exterior packages for the 2014 Mustang, FP6 (541) and FP8 (542). FP6 adds painted black outside mirror skull caps, a painted black decklid spoiler, body colored quarter window louvers and 18 inch painted black aluminum wheels. FP8 adds the same painted black outside mirror skull caps, painted black decklid spoiler and body colored quarter window louvers but this package includes a set of 19” bright machined aluminum wheel with painted black pockets. Finally, the 200+ mile per hour 2014 Ford Shelby GT500 Mustang receives a few minor changes of its own with the addition of Oxford White and Ruby Red Metallic with Tinted Clearcoat while the inside of all non-Recaro race seat equipped GT500 Mustangs will come with heated seats. The changes made to the 2014 Ford Mustang are very minimal and honestly, what little has been added falls far short of making up for the fact that the Boss 302 is gone. The Boss 302 is one incredible piece of machinery so anyone who has had the pleasure of driving one will likely shed a tear over the loss of the Boss option but as they say – tis better to have loved and lost than to have never loved at all. Two years of the new Boss is better than no years and with any luck, we will see the technology from the Boss arrive on the next generation Mustang for the 2015 model year. The good news is that 305hp Mustang V6, the 420hp Mustang GT and the 662hp GT500 will all be back for the final year of this generation Mustang and 2015 can only bring more exciting muscle car news for Ford fans. 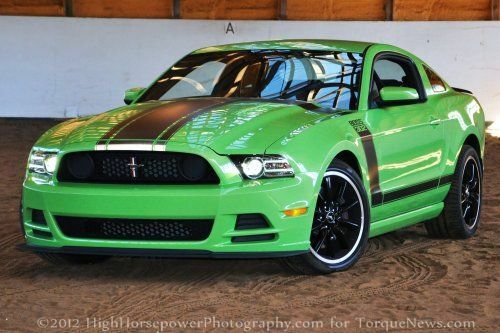 Even though there will be no Boss 302 in 2014, the image above on the right shows the Boss in Gotta Have It Green – a color that I love and will be happy to see return for the 2014 model year Mustang.